WHITE DANCING ELEPHANTS, the debut short story collection from Chaya Bhuvaneswar, is a rich and lovely look at the diversity of love --- romantic, familial and love of self. Run through with threads of the mythic and with more than a nod to Indian literary and religious images, the stories here are still very realistic, exploring relationships, interior lives and expectations. Bhuvaneswar's characters, mostly women, struggle against social norms, cultural rules, and their desires and better judgments. "An insightful, provocative and thoughtful book, WHITE DANCING ELEPHANTS gives readers much to ponder and much to savor." The themes of motherhood, daughterhood, expectations, gender roles and outsider status continue throughout WHITE DANCING ELEPHANTS. All the stories are elegant and restrained. At times, Bhuvaneswar could’ve given up some of that restraint for the sake of drama and pacing, yet overall her style works well and lends itself to the particular tales she tells. “A Shaker Chair” is the disturbing story of a therapist and the young patient she becomes both attracted to and repelled by. Sylvia does her best to treat Maya, but Maya seems to hold back and challenge her in subtle yet important ways in their sessions. As Sylvia is dealing with her own difficult family dynamic, Maya takes advantage of Sylvia’s weaknesses in a surprising and terrible way. Bhuvaneswar does terrific work here building tension and twisting the plot. “Talinda” also focuses on a tense and fraught relationship between two women. The narrator, Narika, is doing her best to support her friend Talinda, who is dying of cancer. However, Narika is having an affair with Talinda’s husband George, thus muddying the waters of loyalty, friendship and selflessness. George and Narika are hoping to have a child together, and their calculations are chilly in the face of their love for Talinda and their concern for her. Indian culture is in sharp relief in this collection, especially as Indian women in the U.S. navigate two cultures in which they find themselves. 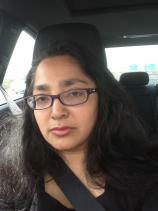 Bhuvaneswar successfully highlights the differences and universals in her stories. Her sentence structure --- sometimes delicate, sometimes brash --- both elevates and distracts. Some sentences are strikingly crafted, while others are clumsy. This inconsistency can be frustrating, but also signals the great promise of her talent. 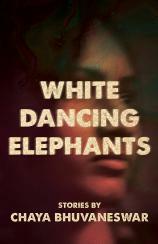 An insightful, provocative and thoughtful book, WHITE DANCING ELEPHANTS gives readers much to ponder and much to savor.